Android is everywhere and Google has announced Android for your car – Android Auto. It is an infrastructure to allow an Android device running the mobile app when connected to an Android Auto-enabled head unit in the vehicle. This functionality offers control over GPS mapping or navigation, music playback, SMS, telephony and web search. 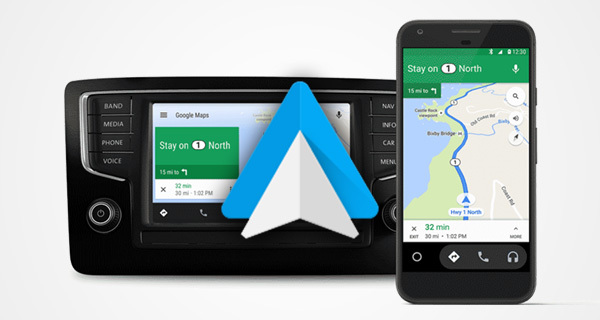 Android Auto brings useful information and organizes it into simple cards. When Android phone is connected to the compatible vehicle or radio, Android Auto will display applications on the vehicle’s screen. Android Auto was designed with safety in mind to minimize distraction and stay focused on the road. It has a simple and customizable user interface with cards, integrated steering wheel controls and powerful new voice actions, clear menus and large icons. Android Auto works by projecting Android apps onto the car display after the phone has been plugged via USB. This enables the use of mobile apps such as Google Maps, Google Play Music, and Google Now and few more. Its main goal is to use the Android phone as the brain of the functions and operations, connecting to the vehicle’s infotainment display to make the apps work seamlessly. ”OK Google” voice command works for most of the functions. The Android App and the developer Menu are shown in the left and right panes respectively in the picture below. To use Android Auto, primary requirement is an Android Auto compatible vehicle or aftermarket radio and an Android phone running 5.0 – Lollipop or a higher version. In phones, in order to use it, free Android Auto app needs to be downloaded and connected to phone to the car using a USB cable. All actions will be handled on the car display and either touch or voice commands can be used. As soon as you plug in it forces a Bluetooth connection. Google has announced wireless support in the near future. Android Auto-compatible cars include most members of the Mercedes-Benz, every nameplate in the Cadillac portfolio and many of Chevrolet, Kia, Honda, Ford, Volvo, and Volkswagen models. Hyundai, Kia, and Chevrolet were among the first companies to build these cars in 2015 after Google introduced it. Good news is that the list of vehicles that support Android Auto is growing every now and then. With the vehicle in Park, turn the car and phone on, plug in smartphone via USB, and review the Safety Notice and Terms & Conditions. Also connect device via Bluetooth if not done. Follow the steps on the screen to give Android Auto permission the access to phone’s features and apps. The apps have a consistent design, with large, round buttons and menus for easy touch and access. The UI elements of the apps are more or less similar and much less distracting so that they need only quick response or rather a glance to start and use these apps. Let us take a look at the Android Auto apps available categorized according to their purposes. The notifications of the apps in car display are as shown in the pictures below. Whatsapp uses the Internet connection to message or make calls and send videos, photos, documents. Group chat is an additional feature. Skype is an app which allows stayi ng connected with people by calling everyone, placing video calls, sending voice messages or photos and sharing highlights. Hangouts is another useful app to keep in touch with friends and family either with one person or in a group. It allows to message contacts even when they are offline, keep in touch across various platforms, connect with Google Phone account and send status messages, photos, etc. Facebook Messenger app enables to instantly connect with people. It is free, fast and secure. It allows reaching anyone in any desired way; sending emojis, stickers, playing games, chatting with businesses, etc. Telegram, WeChat, Kik, Textra are some of the other apps in this category. Waze – GPS, Maps, and Traffic Alerts & Live Navigation allows knowing whatever is happening on the road like traffic, construction, police and routes to save time. It’s elegant and user can control the privacy settings to get all the real time information. Podcast Player is the best app like by many users with great UI. It has access to over 300000 shows in various topics. The colors change to complement podcast artwork. It allows to choose between dark and light display themes and to build a playback queue. There are options for volume boost, skip, audio or video settings, and playback without even touching the phone. There are tools for auto download, storage and filters too. Google Music Play provides free, ad-supported radio based on songs, artists, or albums, or browse by genre, mood, activity, decade, and more according to users’ choice. It enables uploading 50,000 own songs; then listen to them across various platforms. It allows discovering and subscribing to podcast. A family plan and YouTube subscription facilities are present. Audible, Amazon Music, Simple Radio, Player FM, Beyond Pod, Pandora, Spotify are some of the other notable apps in this category. If we swipe right from Home screen Google Now cards appears that bring the right information readily. It has quick access to Search and “Ok Google” to search with voice, or to tell your phone what to do either send a text message, get directions, play a song, and much more. Suggestions bring the app needed to the top of A-Z list. It ensures safer and smarter driving. This complements the driving experience and makes the trip an enjoyable and memorable one. It enhances the drive on the whole.